"Your blog is highly interesting ! I understand you are very passionate about writing. We want to have your interview." Though I have been into freelance-writing for long, I have started Blogging two years ago. I consider myself a newbie & a learner. 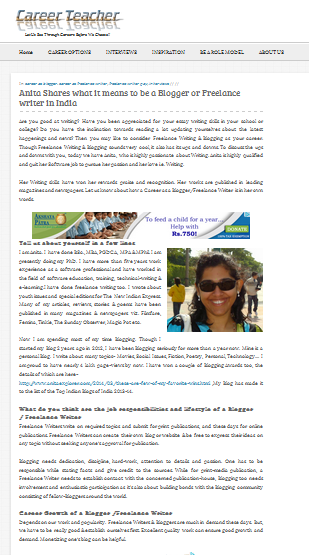 There are far more experienced and very famous Bloggers in India & in the world. Gowardhan had a questionnaire for me that I sincerely filled up and sent across. Thank you Anita for your valuable time and the interview. For many more future interviews!! Cheers! Congratulations, Anita... How fun to be recognized and interviewed. Hearty Congratulations. I wish you to reach many more heights. You are an inspiration to many bloggers and freelancers. Please look into my Third Seminar on Indian Heritage and Culture which presented to young children on recent sunday. Many younger generation children actively participated in my seminar and clarifying their doubts. Please look into my Third Seminar message and give your valuable and inspirational comment. Lovely that you are conducting such seminars, Dokka! Appreciate your efforts. Children will learn about our India's incredible art. Great Going Anita and congratulations!